Guest blogging is an amazing way to get traffic, grow your email list, and increase your ranking on search engines. Attracting a relevant audience has become harder now that everyone and their dog has a blog. But by guest blogging on a site that already has your target audience, you can quickly reap the benefits of that site’s hard work. Guest blogging earns you backlinks – one of the most significant factors in Google’s ranking algorithm because you can link to your site – and it instantly puts you in front of an existing audience. Sometimes it’s nice to start and get a few guest posts published on some small, but relevant sites. But, if you really want to make big strides, you eventually need to get on a top site, and it’s not as hard as you might think if you know the steps to take. Getting published on large sites can work wonders in both the short and long term. I’ve watched it happen with my own blog when I’ve been published on sites like Entrepreneur, The Huffington Post, and The Next Web. To get good returns with guest blogging, you need to go where a large volume of your target audiences are, and, in order to get your content in front of those audiences, you need to go to sites that publish content like yours. Below are a few strategies you can use to figure out what sites are likely to provide the best results. First, you have to ask yourself, “Who are my potential customers?” You can’t decide how to target your guest post unless you know who you’re trying to reach. Then, you’ve got to think about where your potential customers are. What sites do they visit frequently? What blogs do they read? Figure this out by conducting customer development interviews, searching on Google for words and phrases your customers are likely to use, and researching with audience intelligence tools such as analytics.twitter.com. Lastly, you have to make sure that these sites accept guest posts. If they don’t have a page for guest submissions (see No. 6 on how to find this), browse their archives and see if there have been any guest posts published. Your prospect list can look much like a CRM, a comprehensive list of places for which you want to write with the ability to track your communication with the site (getting published can sometimes require many follow-ups). 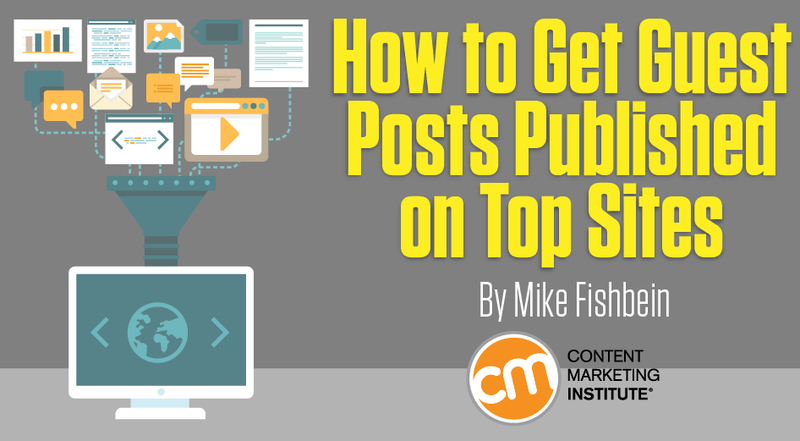 As you might expect, any blog worthy of your time is going to want to publish high-quality content. In a world where everyone is a blogger, it’s more important than ever to create content that truly provides value. To make sure I’m producing content that people find valuable, I apply lean start-up principles and customer-development tactics to create content. I use customer-development tactics to learn about people’s problems and how I can provide value in solving them. I apply lean by running experiments and producing content iteratively so I don’t spend too much time and money on something my customers won’t find valuable. Take note of content your competition is producing that performs well. Use keyword research to find out what people are searching for. Look at platforms such as Amazon to see what content is performing well. 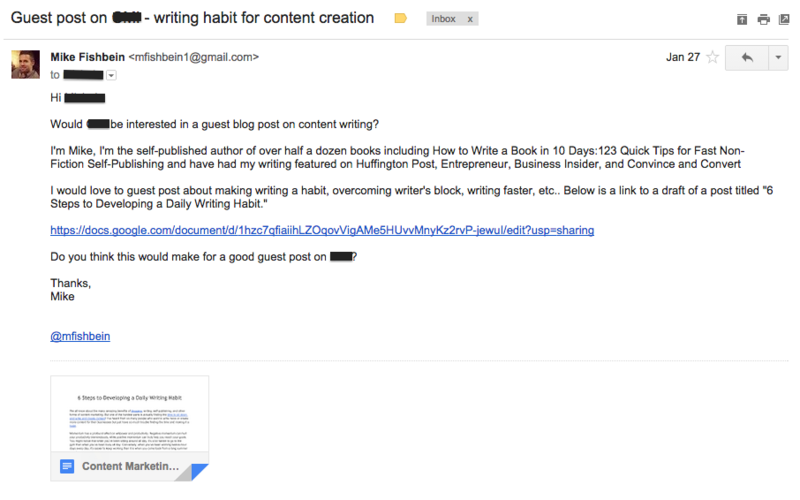 Write blog posts about given topics, and gain feedback as you go, before writing an entire book. Listen to the questions frequently asked of you. Questions are requests for information. So if a question comes up often, it’s an indication that there’s demand for information on that topic. Another way to create awesome content is to browse on Quora – a social question-and-answer network. If people ask or follow a question on Quora, it’s an indication that they could use more information on that topic. Browse questions within your topic area, industry, or on the problem you are solving. Write blog posts to answer the questions with the most followers, or answer the questions on Quora itself. Some people recommend pitching an idea or a title before sending the post, but I’ve had better reception when I send a draft of the post. I recommend experimenting with this, and of course following the guidelines of each site. Make a clear ask at the beginning and end. Introduce yourself and state some accomplishments to build authority, social proof, and rapport. Mention the article, what it’s about, and why you think it’s valuable. Link to the complete post in Google Drive. If and when you get published, be sure to share it on your social channels and reply to any comments, as this may make the site more inclined to have additional work published there. Once you’ve been published on a few smaller blogs it can be easier to reach out to bigger names. The more bylines you have, the more leverage you have to be chosen by a bigger site. Sometimes it’s not just how well you write but who you know. Having a referral from someone an editor trusts can be a great way to motivate the site to publish your content. I became a regular contributor to The Huffington Post as a result of a long chain of networking events, connections, and follow-ups. It started with a workshop that I wasn’t even sure would be good. The teacher seemed underqualified, and I thought of a million other things I could be doing. It turned out to be a great workshop. I followed up with the teacher, who happened to be the best networker I had met. He inspired me to really make networking a priority and informed some of my strategies. We became and still are good friends. The teacher invited me to an event a few months later. Though I wasn’t sure what it would be, I went because I trusted his judgment. It turned out to be a private party for Reid Hoffman, co-founder of LinkedIn, to launch his new book, The Startup of You. It was hosted by former New York Mayor, Michael Bloomberg. I met the president of MTV and some start-up founders. I was talking to an entrepreneur I had met that night when he said, “Hey, there’s Arianna Huffington, let’s go talk to her.” My initial reaction was anxiety. But I turned off my brain, reminded myself of how important it was to get out there, and I talked to her. I don’t even remember what we talked about, but eventually she offered to have me contribute to her site and I got her email address. The next day I emailed her, even though I was still nervous. She responded by introducing me to an editor. This interaction has led to more business and guest-blogging opportunities. The backlinks and traffic received from Huffington Post definitely made the networking worthwhile. It sounds so rad to get published on the biggest sites in your industry. And don’t get me wrong, it can deliver some incredible results, but smaller, highly relevant sites, can produce great results too. In addition, getting published on smaller sites can help you build your reputation, social proof, and track record. If a post’s good performance is reflected publicly (i.e., by a notation of shares on the page), an editor may be more inclined to publish you. If your content has produced traffic in the past, there’s less guesswork for the editor in evaluating your potential. One surefire way to start off on the wrong foot with editors is to fail to follow their instructions for pitching. Every site has preferences or guidelines for potential guest bloggers. Look for this information on a Contact or Contribute page. I thought business was all about “vision” and “creativity.” It turns out much of it is about follow-up. I can’t tell you how much money I’ve made from simply sending follow-up emails. It’s annoying. But it works. It took months of following up with Entrepreneur before I got a couple posts published. Now that I’ve proven myself, I’m able to get published there more easily. Want to grow your content marketing knowledge? Start with two free e-courses – part of CMI’s comprehensive Online Training & Certification Program, which contains over 19 hours of must-know strategies, tactics, and best practices, delivered by leading experts. Sign up now. 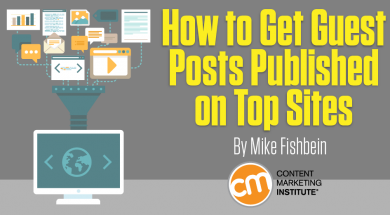 Mike Fishbein is a content marketer and the author of Guest Blogging Master Class. His guest posts have been published on sites like Entrepreneur, The Huffington Post, and The Next Web.